The Florida Lottery is warning of an emailed scam seeking financial and other personal information, according to a Thursday news release. 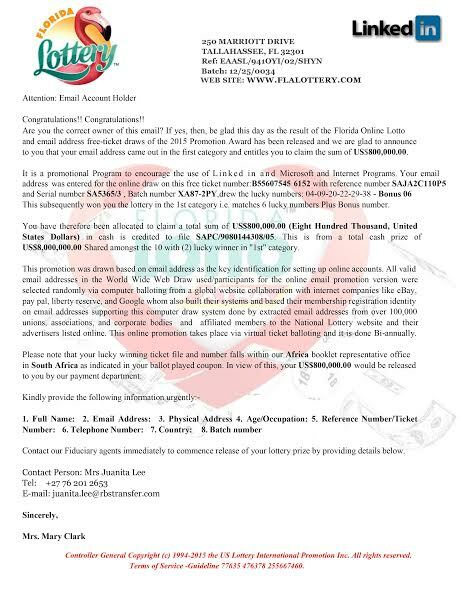 “The email includes the Florida Lottery logo and uses the Florida Lottery headquarters’ address as part of the letterhead,” the statement said. The scam letter also refers to LinkedIn and Microsoft. “The email states that the recipient has won a prize and should contact the listed ‘Contact Person’ to claim his or her prize,” it says. “The Florida Lottery does not contact players to inform them that they have won a prize unless they have entered a promotional game or second chance drawing on the official Florida Lottery website or social media pages,” the agency said. Those who have received such a message should not respond, but instead call the Lottery’s Division of Security at (850) 487-7730.